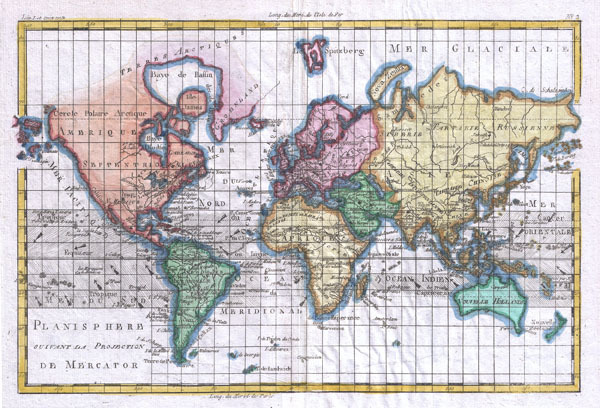 A fine example of Rigobert Bonne and G. Raynal's 1780 map of the world on a Mercator Projection. Offers a fairly advanced perspective of the world showing the most recent discoveries and explorations. Nonetheless, there are a few interesting errors. In the northwestern part of America a pre-Cook geography includes an archipelago roughly where Alaska stands today - no doubt a primitive attempt at rendering the Aleutians. Australia, labeled Nouvelle Holland is linked to Tasmania - a misunderstanding that would be correctly shortly after the publication of this map. Bonne additionally notes ocean currents in the Tropics. Drawn by R. Bonne for G. Raynal's Atlas de Toutes les Parties Connues du Globe Terrestre, Dressé pour l'Histoire Philosophique et Politique des Établissemens et du Commerce des Européens dans les Deux Indes. Rigobert Bonne (October 6, 1727 - September 2, 1794) was one of the most important French cartographers of the late 18th century. Bonne was born in Ardennes à Raucourt, France. He taught himself mathematics and by eighteen was a working engineer. During the War of the Austrian Succession (1740 - 1748) he served as a military engineer at Berg-op-Zoom. It the subsequent years Bonne became one of the most respected masters of mathematics, physics, and geography in Paris. In 1773, Bonne succeeded Jacques-Nicolas Bellin as Royal Cartographer to France in the office of the Hydrographer at the Depôt de la Marine. Working in his official capacity, Bonne compiled some of the most detailed and accurate maps of the period - most on an equal-area projection known erroneously as the 'Bonne Projection.' Bonne's work represents an important step in the evolution of the cartographic ideology away from the decorative work of the 17th and early 18th century towards a more scientific and practical aesthetic. While mostly focusing on coastal regions, the work of Bonne is highly regarded for its detail, historical importance, and overall aesthetic appeal. Bonne died of edema in 1794, but his son Charles-Marie Rigobert Bonne continued to publish his work well after his death. Guillaume Thomas Raynal (April 12, 1711 - March 6, 1796) was a French writer, philosopher, and historian active during the Enlightenment. Raynal was educated as a Jesuit, but left the order for unknown reasons, and moved to Paris where he dedicated himself to the production of a number of minor but popular historical works. Raynal's histories opened doors to elite social and artistic circles where he met and befriended various members of the Philosophe Coteries. Raynal's most important work is generally considered to be a 1770 collaboration with Diderot and others entitled, L'Histoire philosophique et politique des établissements et du commerce des Européens dans les deux Indes. Some of the philosophical ideas developed in the book drew negative attention from the authorities who banned the book and posted a notice for the arrest of its authors. Raynal fled to Berlin and later to St. Petersburg, where he lived for a number of years before returning to France in 1787. Though not a cartographer Raynal's name is often attached to several Atlases by Rigobert Bonne, from whom he composed the text. Raynal, G., Atlas de Toutes les Parties Connues du Globe Terrestre, Dressé pour l'Histoire Philosophique et Politique des Établissemens et du Commerce des Européens dans les Deux Indes, 1780. Very good. Original centerfold. Platemark visible. Blank on verso.